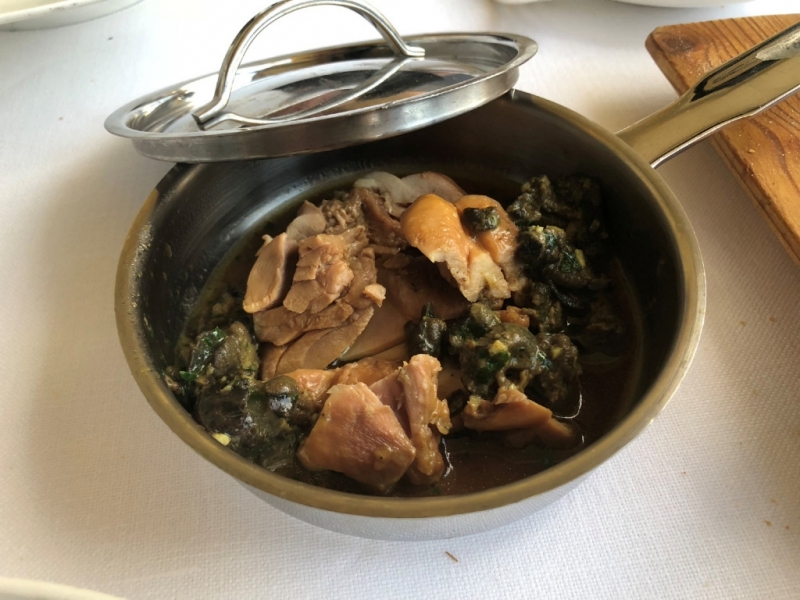 Italians embrace mercurial politicians, but when it comes to restaurants, they’re a nation of Rockefeller Republicans – prizing tradition and voting for continuity. Nowhere is this truer than in Florence and Tuscany, where restaurant menus can seem interchangeable. That’s fine with me. I can’t argue with the likes of Papa di Pomodoro, Ribollita, or the obligatory pre-meal antipasti (particularly Chicken Liver Crostini). Nor do I have any quarrel with Chianti or Super Tuscan wines. 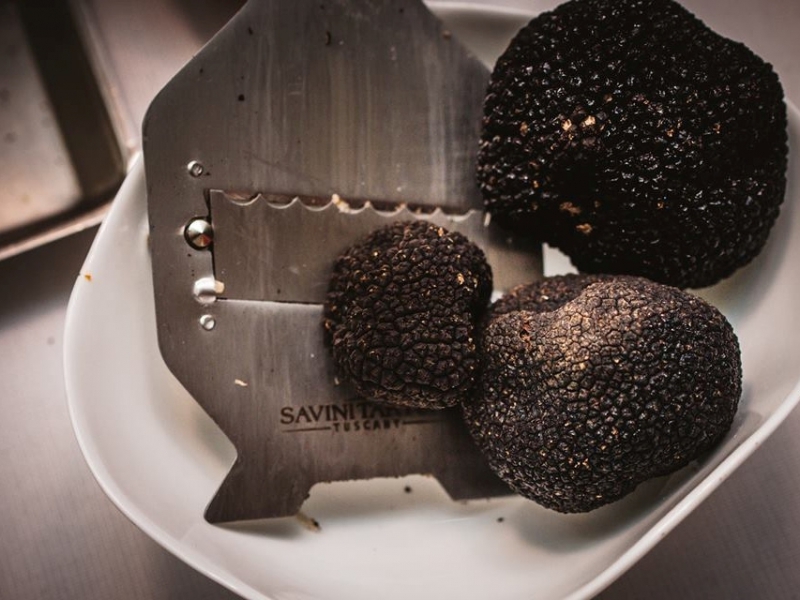 And when Porcini Mushrooms are in season…well, you know. And who can turn down the iconic Bistecca Fiorentina? 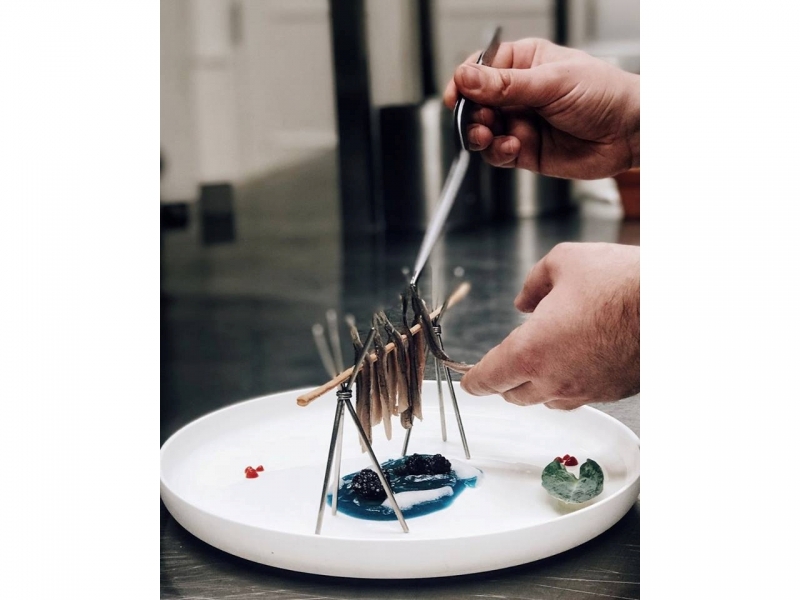 Not only do the menus hew to tradition, the flavor profiles fall within a fairly narrow range, and wherever you go plating tends to be honest and straightforward, without a lot of flair. But after several evenings of eating the same sort of stuff, Joanne and I needed a counterpoint. 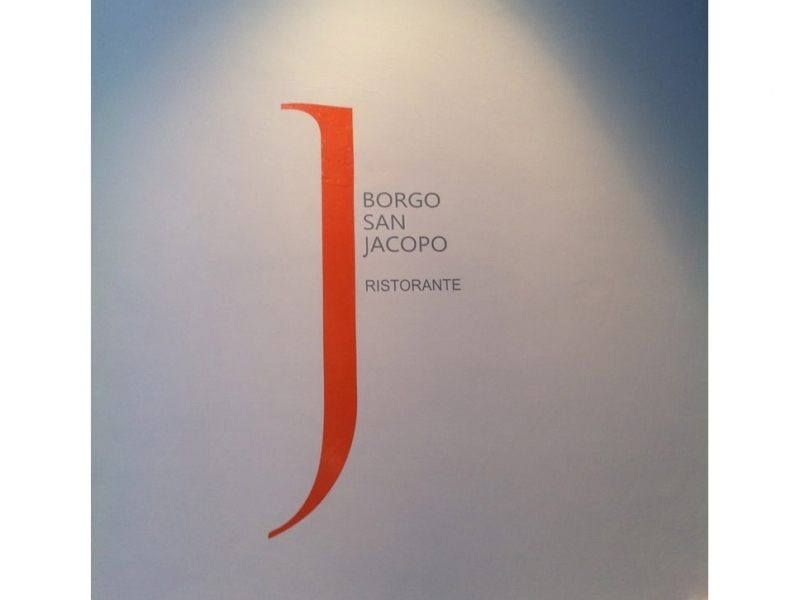 And we found it at the BORGO SAN JACOPO. Now, folks: Write this down. 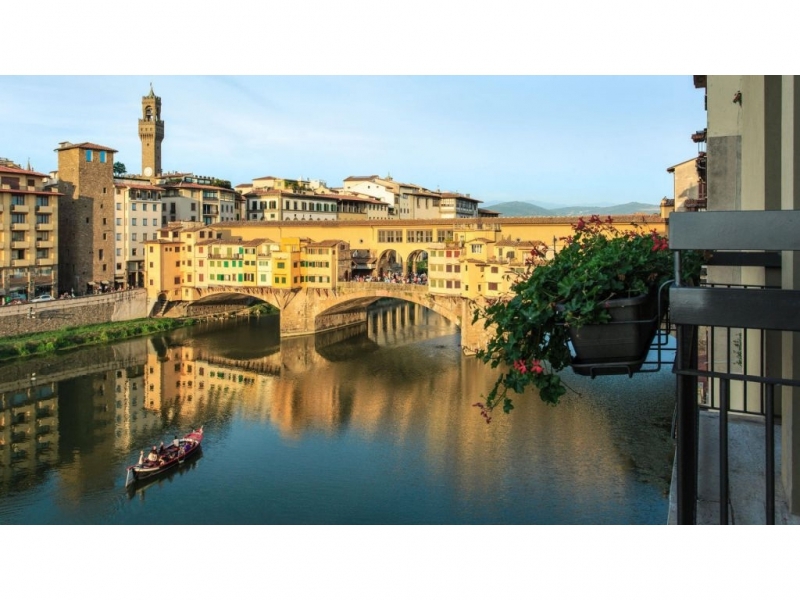 As you cross the Ponte Vecchio to the south and take an immediate right, you’ll come to the HOTEL LUNGARNO, one of the best in Florence and home to this fantastic restaurant. 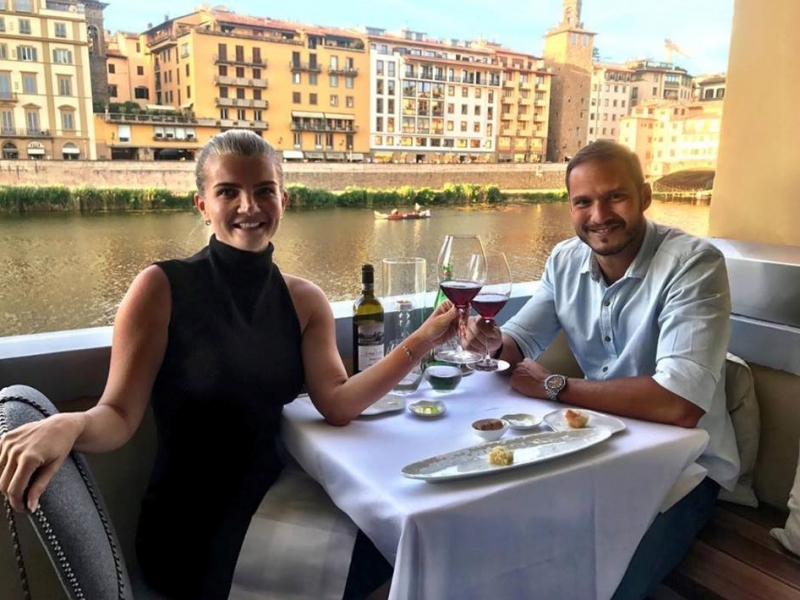 Reserve well in advance and request one of the four – yes, only FOUR – coveted tables on the tiny terrace overlooking the Arno, directly across from the Ponte Vecchio. 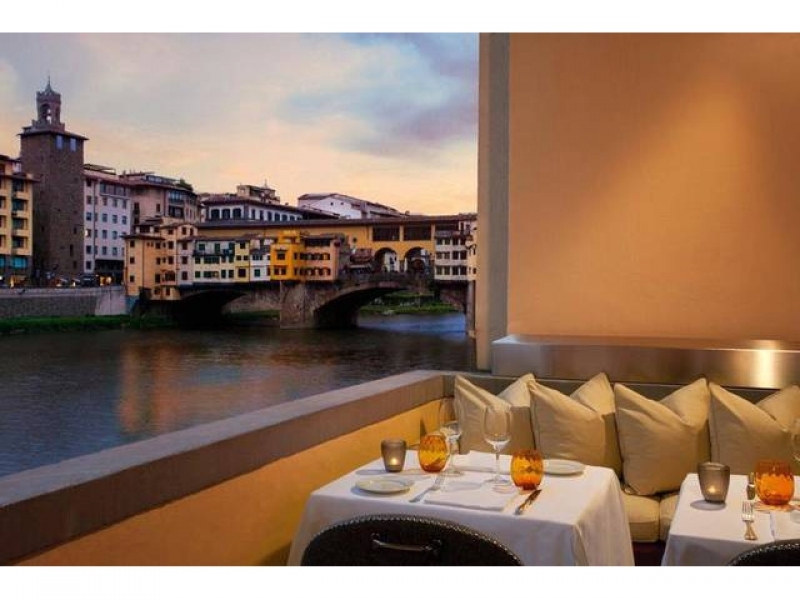 These four tables – Numbers 12, 13, 14 and 15 – may be the most romantic in all of Florence. 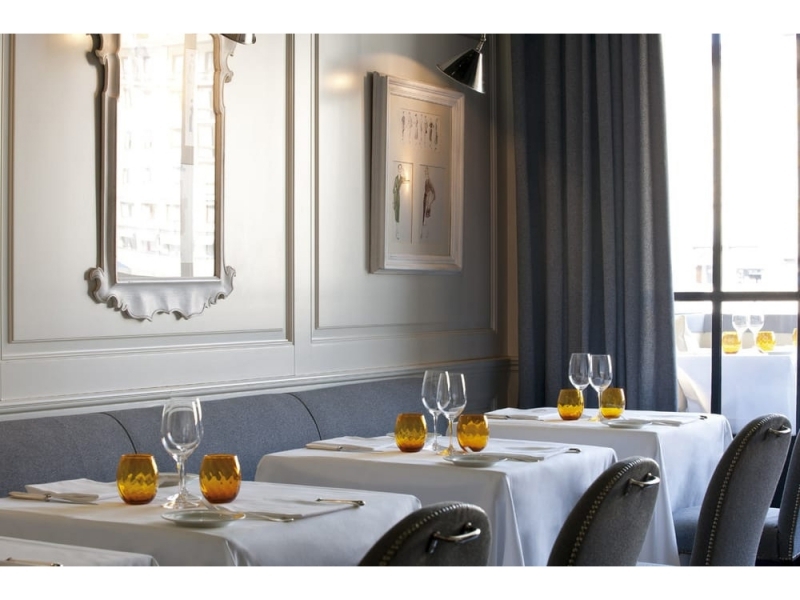 The restaurant is owned by Ferragamo and the Michelin-starred kitchen is under the command of the acclaimed chef, Peter Brunel. The place is not cheap. But neither is it a rip. Prices fall right in line with similar spots in Minneapolis and other cities. 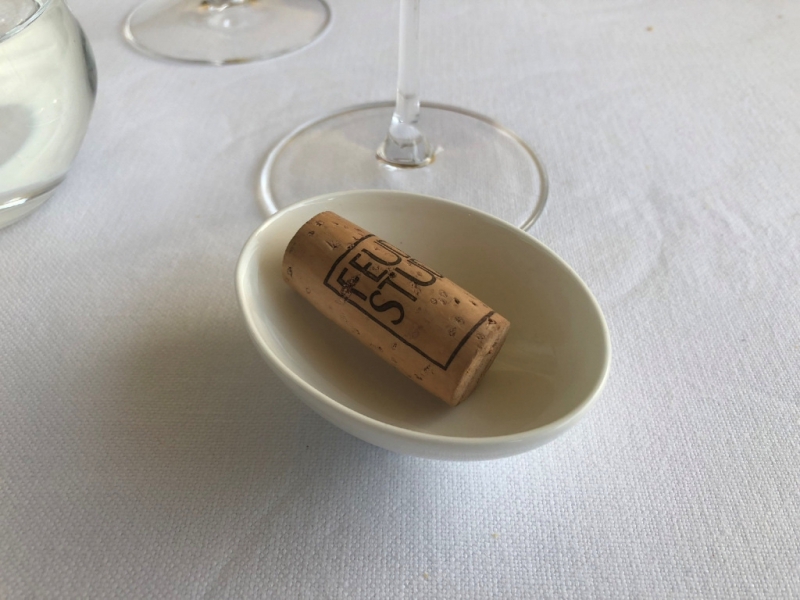 I had read about Peter Brunel’s creative plating and because we were in the process of designing SALUT’s fall menu, I wanted to see what he was up to and just what might apply to SALUT. Dinner will be special. 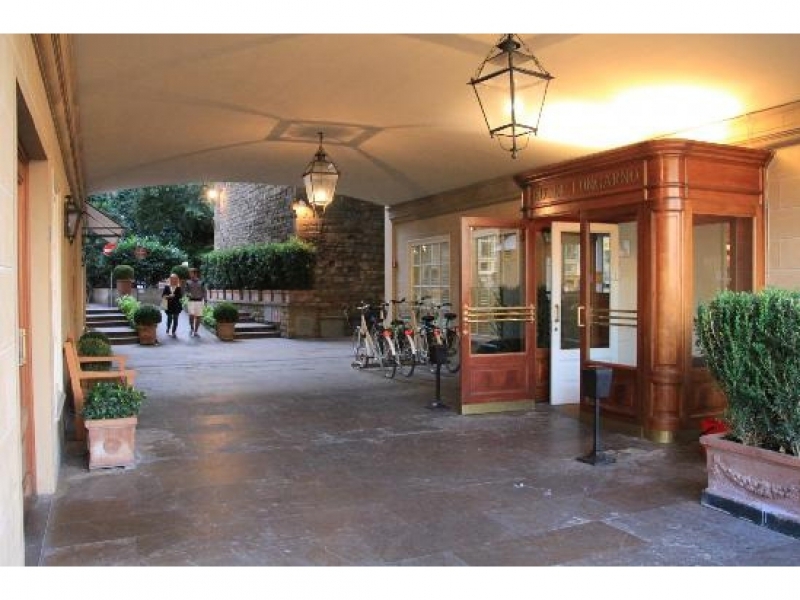 Peter Brunel won his first Michelin star at the age of 28 when he helmed VILLA NEGRI ristorante in Vincenza. 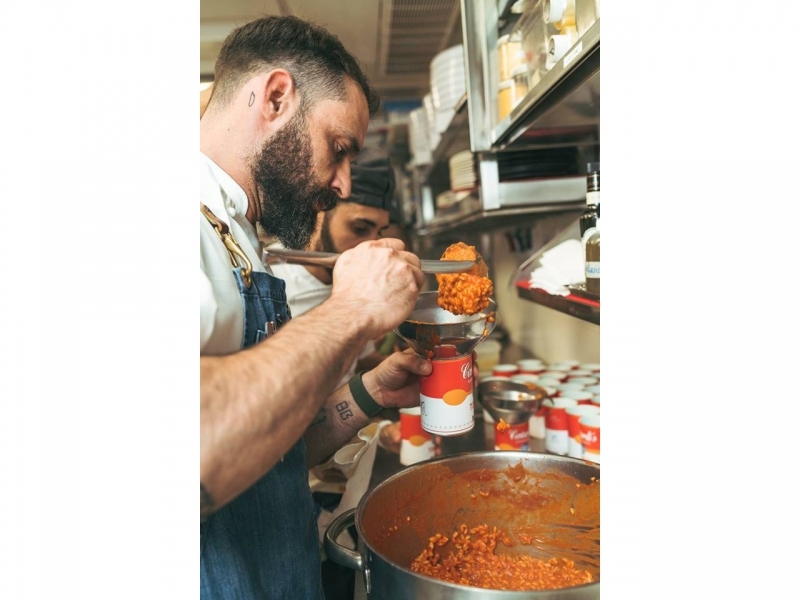 The youngest Italian chef ever to do so, Brunel winks at Tuscan traditions, transporting familiar dishes to innovative and unexpected dimensions, sometimes involving a bit of molecular gastronomy. 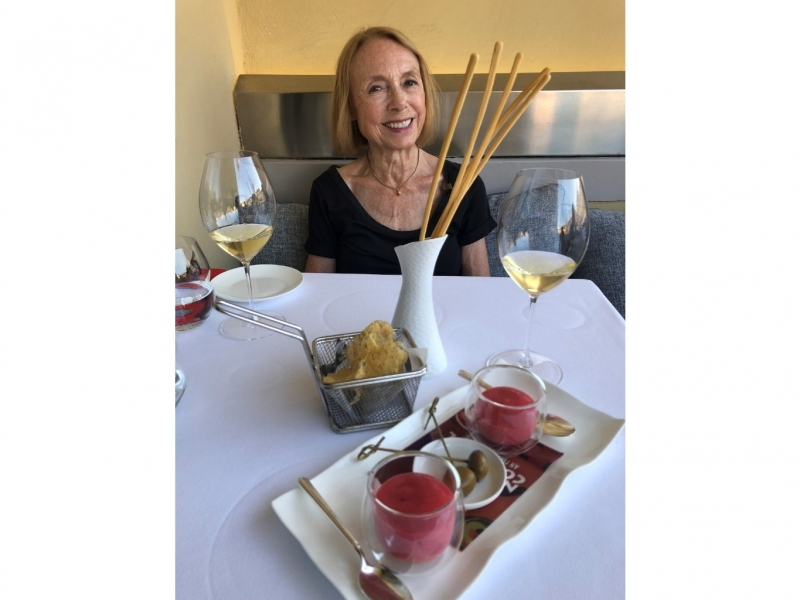 I don’t quite know how it happened, but Joanne and I managed – as walk-ins – to snag one of the four tables on the terrace. WHEW! And WOW ! The show began with an amuse bouche of two small glasses of refreshingly cool raspberry/orange foam generously invigorated with gin. The glasses “bookended” what appeared to be two rather large olives. Fooled me! They turned out to be Baby Peaches (yum) soaked in Campari (double yum). 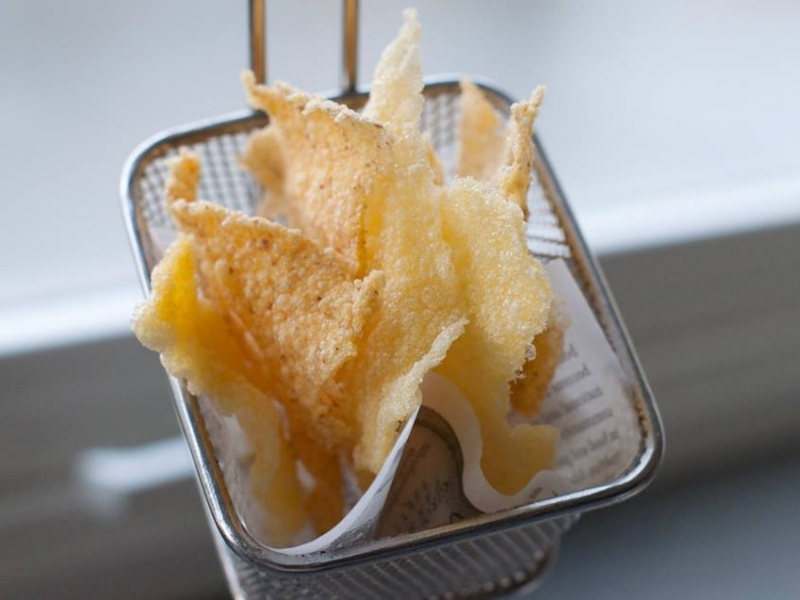 To offset the smoothish texture of the foam, a fry basket of homemade crispy Corn Chips rode shotgun. 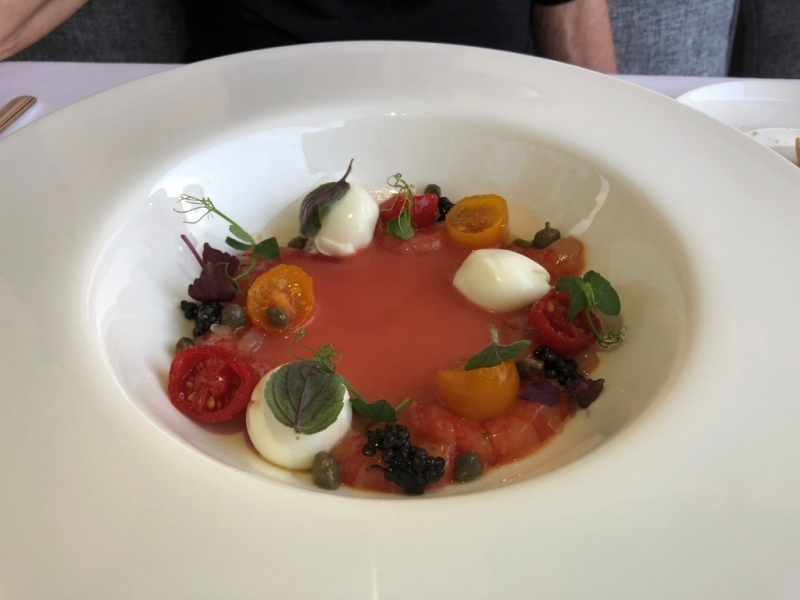 Among the appetizers, Joanne loved the baby prawns with cherry tomatoes, mozzarella, capers, fresh herbs and lime, enlivened in a bright and cooling, intensely flavorful tomato broth. It was called Prawns and Caper Caprese. Because it was a warm summer night, I chose a cooling appetizer as well, one plucked from the eight-course, prix fixe ALL POTATO MENU. 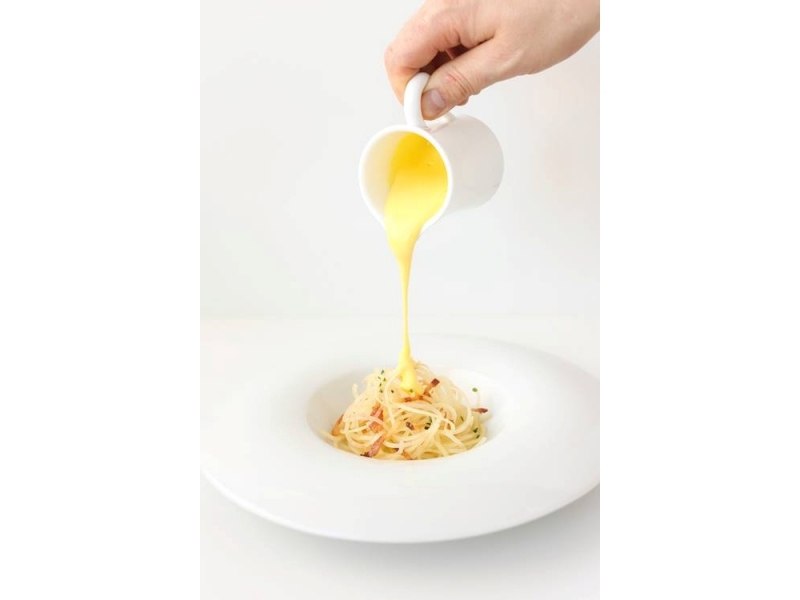 It consisted of two small vessels of cold potato velouté – one iteration with hen eggs, the other flavored with a little pop of lake trout eggs. The dish was called Duet of Cold Potato Soup with Lake and Land Eggs. 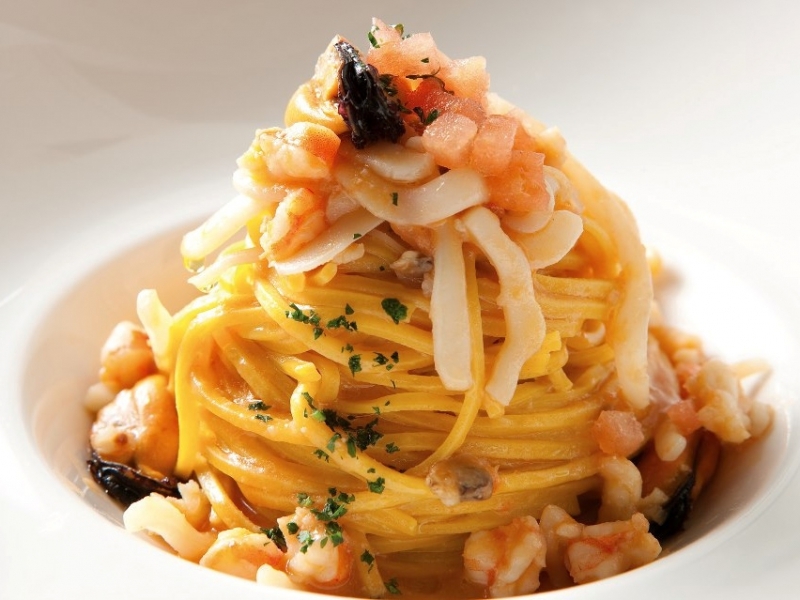 BTW….the All Potato Menu also featured Potato “Spaghetti” Carbonara – the “spaghetti” being made entirely out of potatoes. 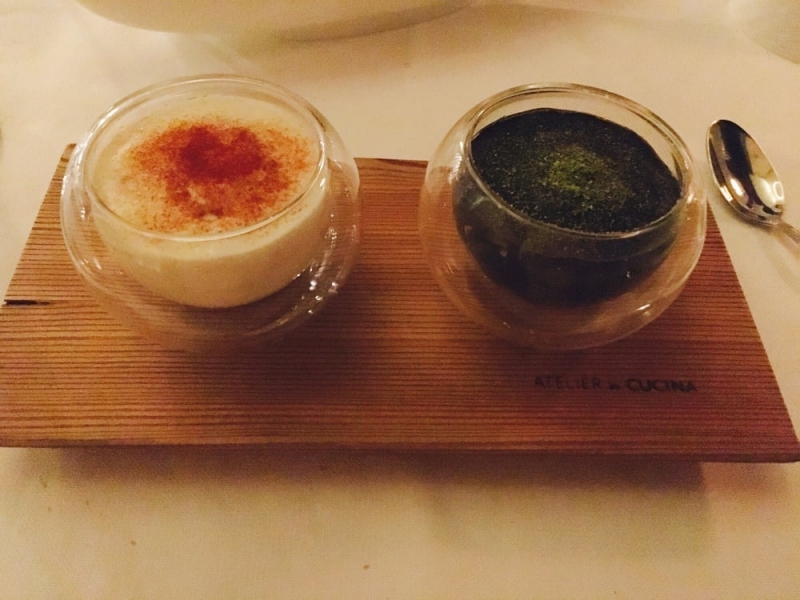 That’s molecular gastronomy coupled with a dose of chemistry. Instead she replied, “Well, it’s 7:30 already and we’ve allotted you two hours to complete your dinner. We need this table at 9:00.” Needless to say, I asked for the manager, who turned out to be polite, contrite and embarrassed about the server’s “bedside manner.” He told us that the table was ours for the entire night if we chose, and he assigned another, more gracious, server to our table. Let me stop a moment to say, as an operator, that I understand the focus on table turnover. But that’s my problem, not the diner’s. Guests should never feel rushed. And if they specifically ask you to slow down the service, you don’t exacerbate the problem the way our server did – you go into damage control mode the way the manager did. 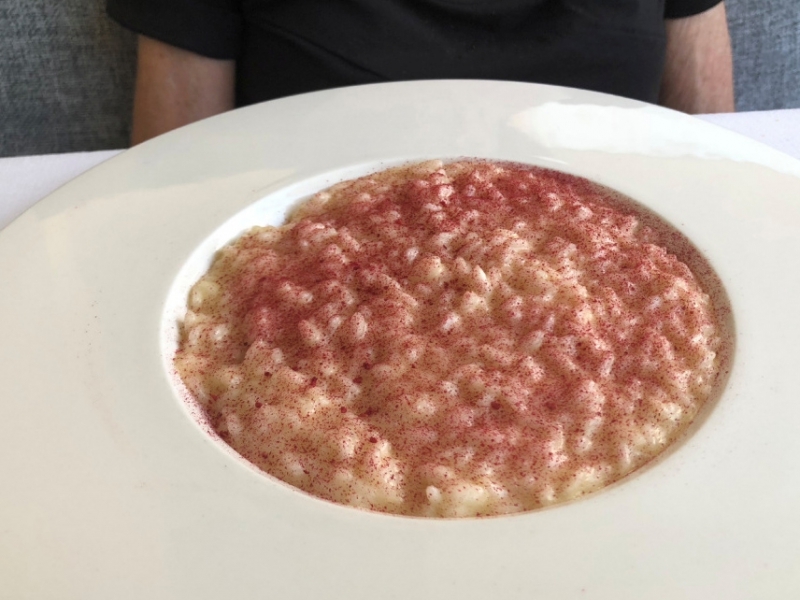 Back to the meal – and the steady flow of wit and whimsy as evidenced in Joanne’s second course: a Risotto that infused Arborio rice with apple water, horseradish, vin santo (sweet dessert wine), raspberries and, of course, Parmigiano Reggiano. 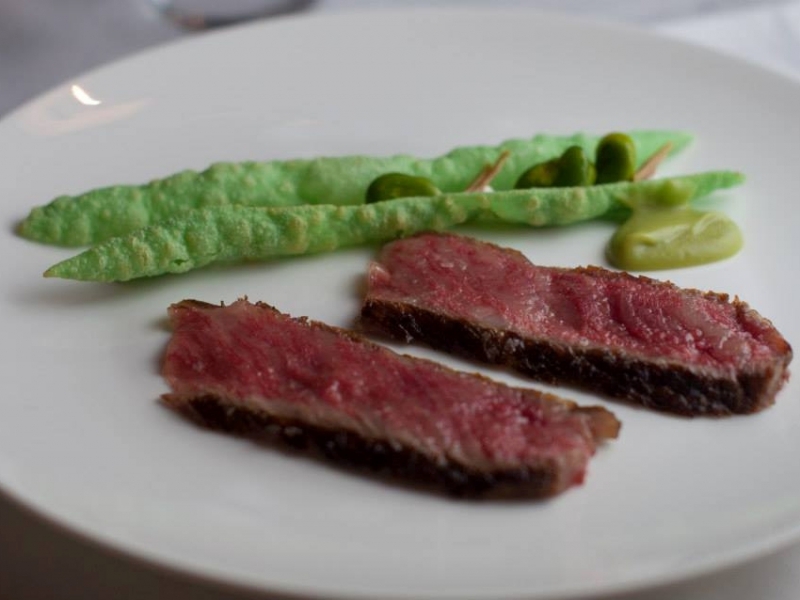 Anchovies ... Grant Achatz ... Are you watching? 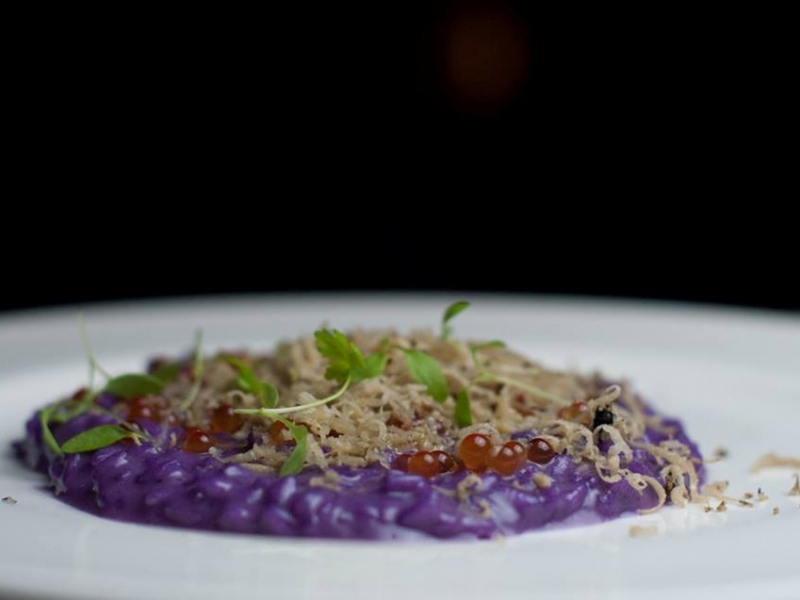 One of the other tables ordered an intriguing dish that our server explained to us was risotto with red cabbage jus, trout roe, black truffles and a generous grading of Parmigiano Reggiano. WAIT A MINUTE!!!! 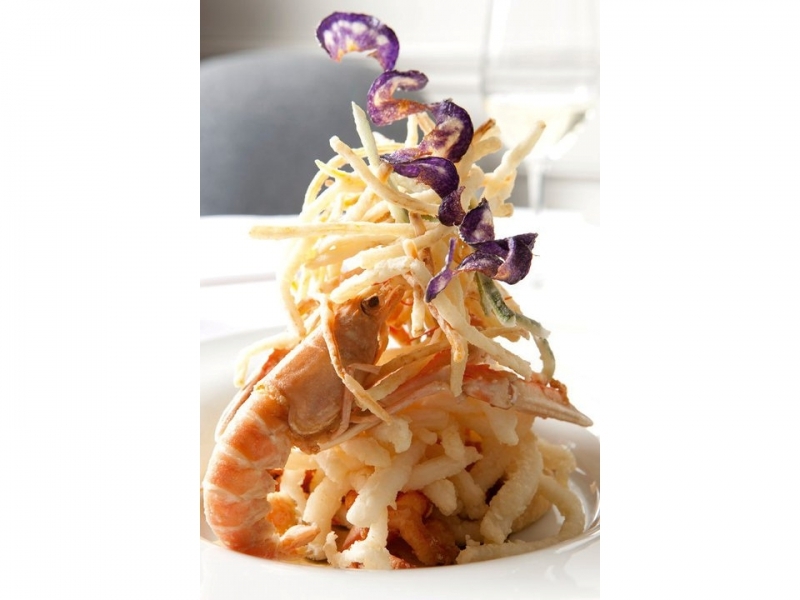 I thought cheese was NEVER, EVER to be grated on a dish with seafood. SCREW THAT. I bet it was delicious! 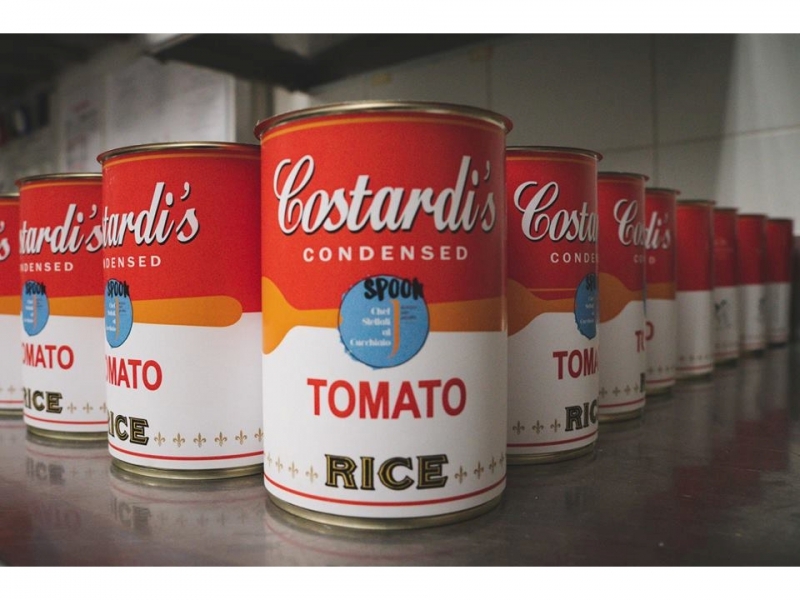 Oh, and speaking of surprise and delight, Brunel serves his Risotto Pomodoro in a kind of Campbell’s Soup-like tin. 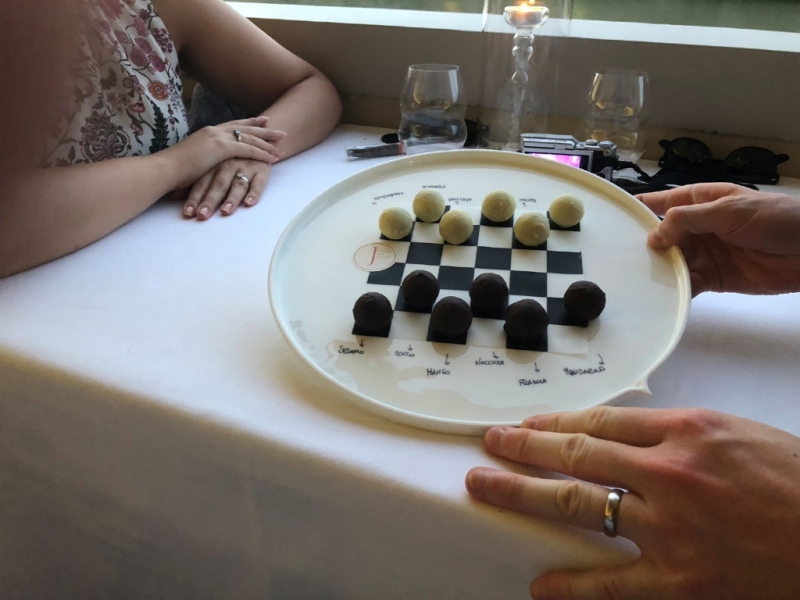 I really admire witty plating like that, especially in fine dining restaurants where it’s important to show that you’re not too tightly wound. Being precious and full of yourself is not the recipe for your guests to have a fun and relaxing experience. Let’s remember: It’s JUST A RESTAURANT. We’re not curing heart disease here. 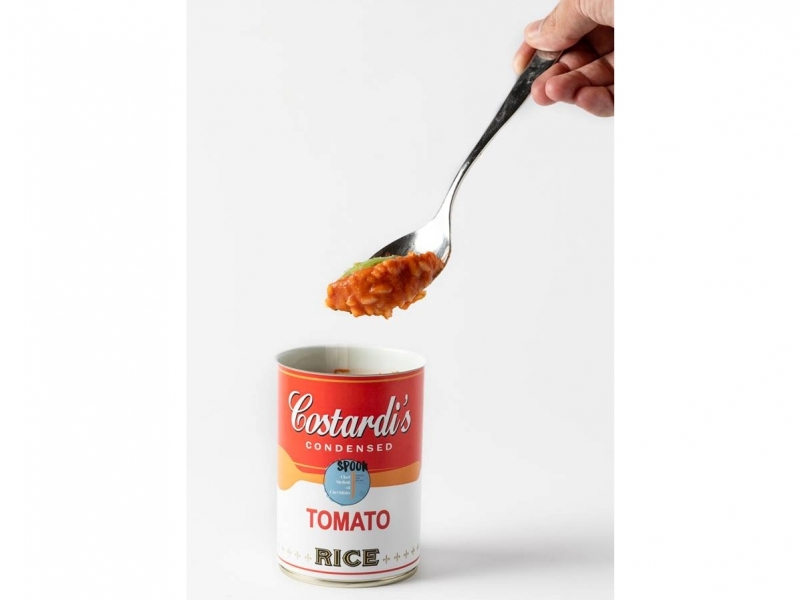 And it's served in a can! Among the pastas, we also tried a Wild Boar Ravioli (very Tuscan) prepared with “Cinta Senese Acid Butter” (not-so-Tuscan-sounding). 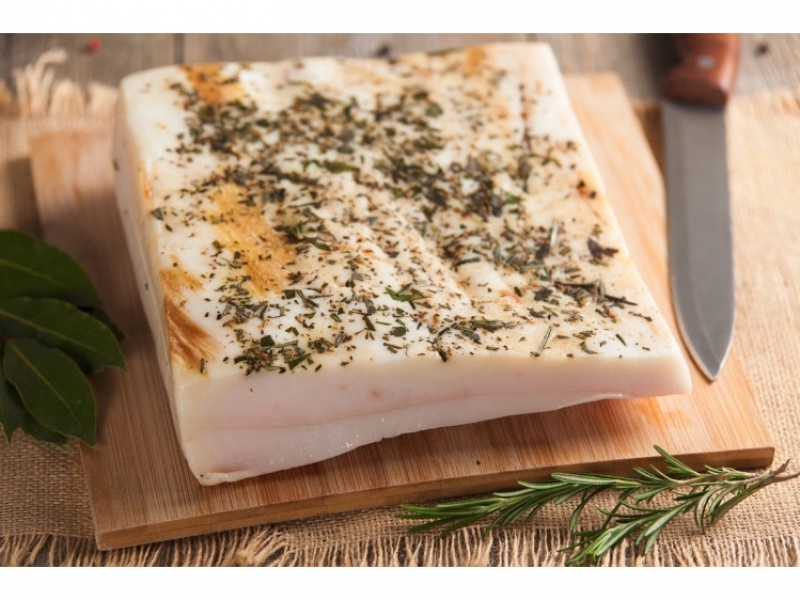 It turns out that Cinta Senese refers to a local Heritage breed of pig known for its abundance of fat, and the “acid butter” in the ravioli isn’t butter at all – it’s old fashioned fatso goodness: LARD! 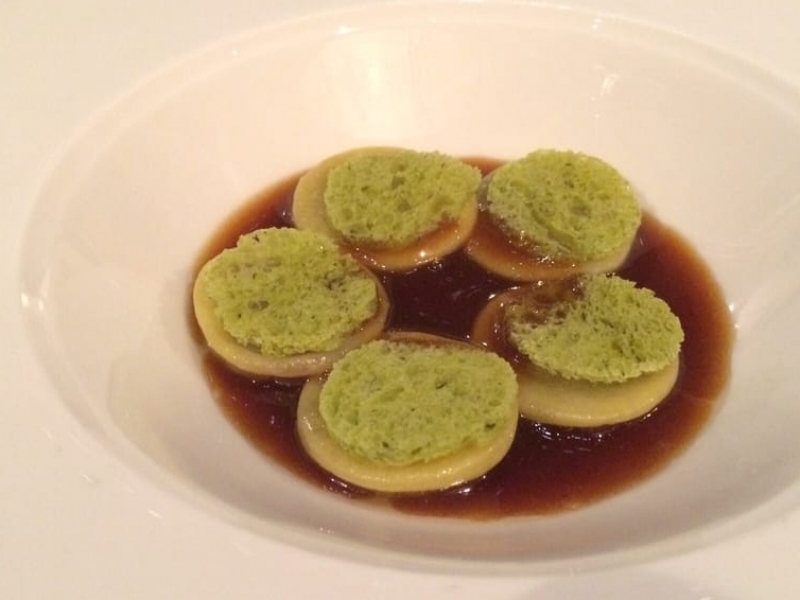 Wild Boar Ravioli with Parsley Toast & Cinta Senese "Butter"
Main courses were indeed very, very pretty. And both of our selections were very, very good as well. 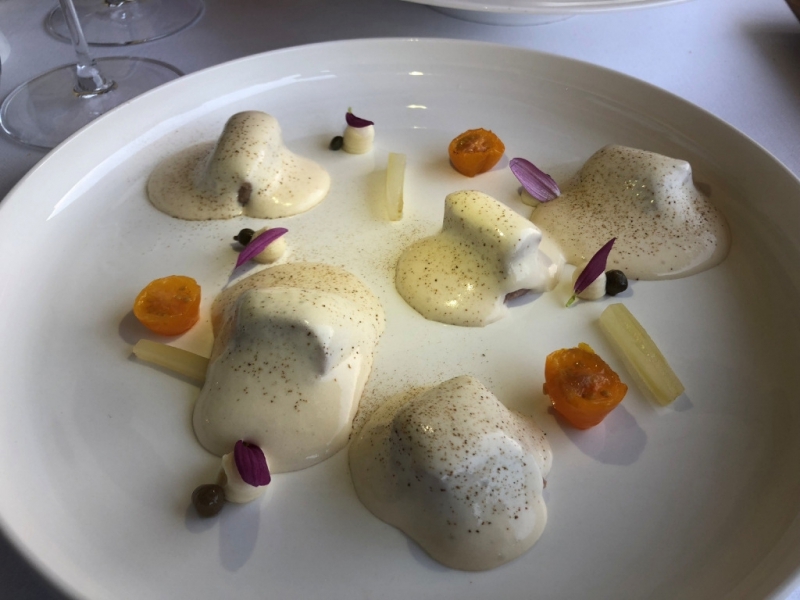 Bite-sized beauties of pink veal with a sauce of potato and veal jus were plated with just-picked cherry tomatoes and a scattering of caper leaves. 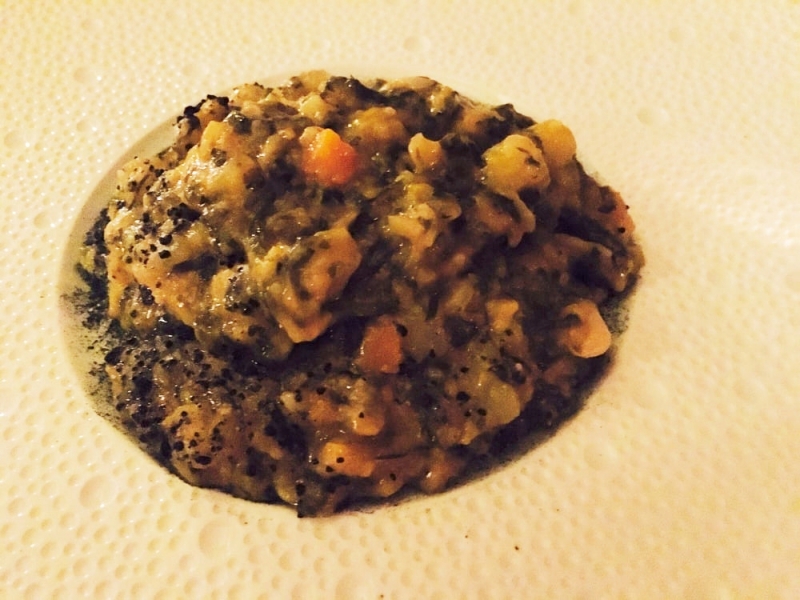 Portions were small, but rich and nuanced as only veal can be. 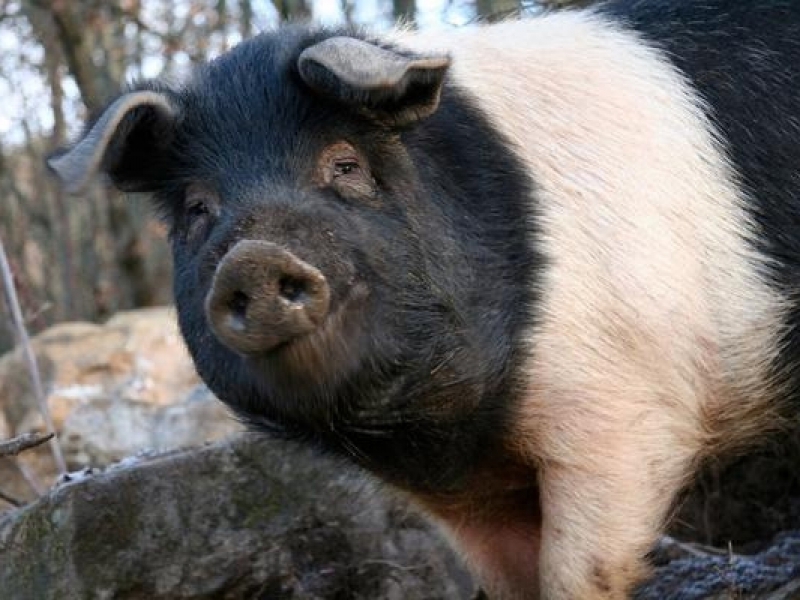 Joanne, of course, will not go near veal. She opted instead for Bresse Rooster in two different cooking techniques: breast and leg with parsnips, onions, snails and saffron cream (I did not know that France was permitted to ship Bresse chicken to other countries – certainly not the U.S.) But if the pedigree of the chicken surprised me, the flavor did not: it was spectacular. 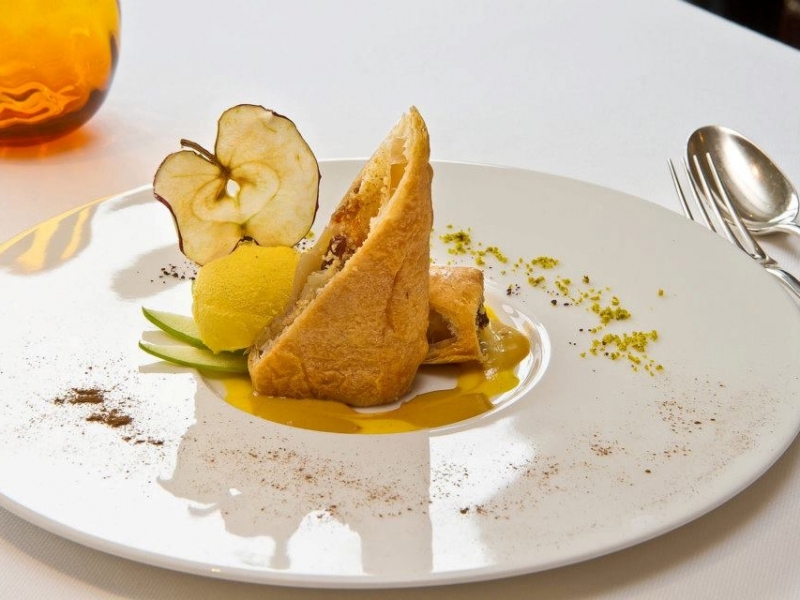 We forged on to dessert, including Apple Strudel and Chocolate Lollipops. 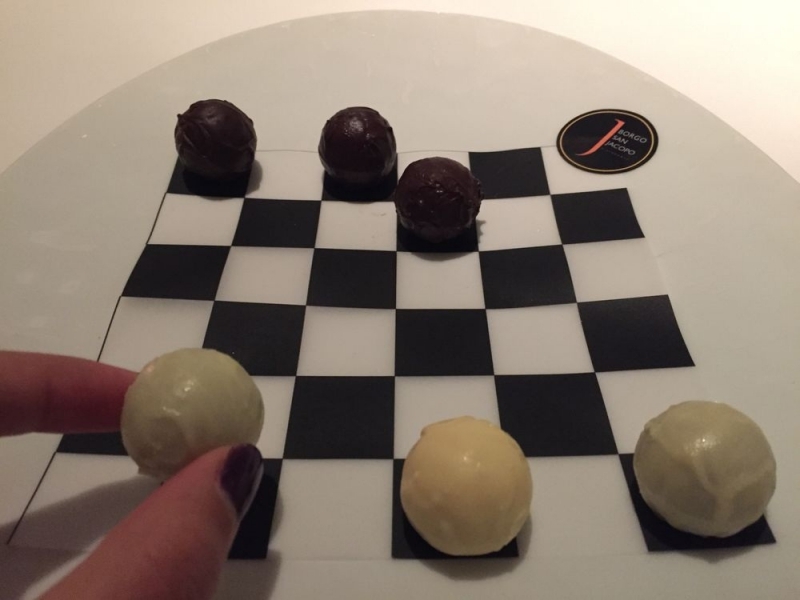 They were very good – but I wished we had ordered what the table next us had: a finger food presentation of six white and six dark chocolate truffles laid out on a checkerboard plate. A THING of JOY! I was taught not to play with my food. Thank God Chef Brunel did not get the message! Oh my god! 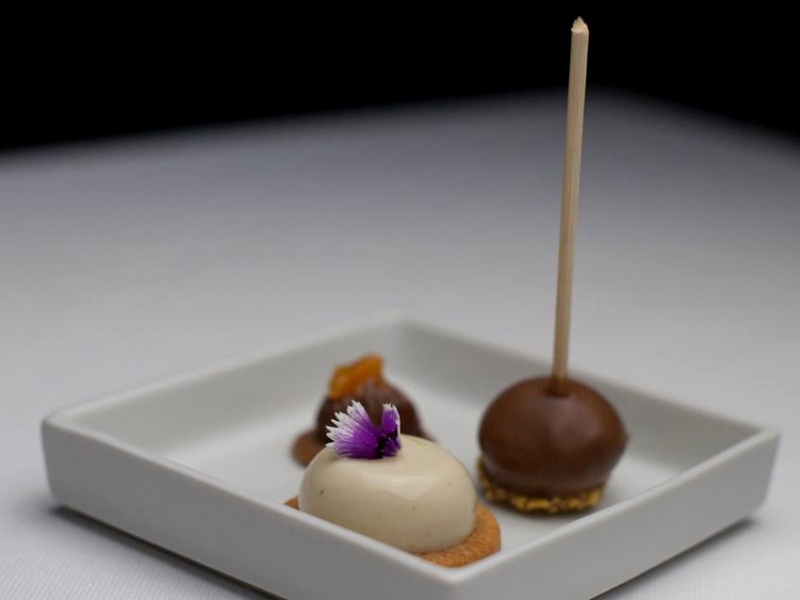 What fabulous food Phil—-how about preparing some of these dishes at Salut? I would have loved to see Joannes red face when you confronted the server. Great blog. Thanks for including me.